ETFs (Exchange Traded Funds) are the “hot” investing product. Fund companies are tripping over themselves to bring new ETFs to the market place. This reminds me a lot of the mid to late 90s and the proliferation of new mutual funds. While the number of ETFs is lower, the growth in new products is still high. Traditionally most ETFs have been index products. The new frontier is actively managed ETFs. Several providers have filed for approval to offer active ETFs, no doubt buoyed by the success of the ETF version of PIMco’s popular Total Return bond fund (tickers BOND for the ETF and PTTRX for the fund). I have been a big user of ETFs in the portfolios of my individual clients. To date I’ve used index ETFs exclusively. The low cost and style purity are the big selling points in my opinion. Many of these new ETFs rely on the hypothetical back-testing of these new indexes. While history is not always a good predictor of future performance, I like to see an ETF with an underlying index that has been “battle tested” in the real world. iShares Russell 1000 Growth ETF (IWF) tracks the Russell 1000 Growth Index, the growth slice of the Russell 1000 Index. Vanguard’s Growth ETF (VUG) is in the process of switching index benchmarks as part of an overall switch of benchmark providers by Vanguard across many of its index mutual funds and ETFs. The new provider’s index will remain a bit different from the Russell index used by the Barclay’s ishares product. The Schwab U.S. Large Growth Index (SCHG) tracks Dow Jones U.S. Large-Cap Growth Total Stock Market Index, with a smaller market cap than the benchmark index of the other two ETFs. Additionally the Schwab ETF has higher weighting in financial stocks than most other Large Growth indexes. To most investors these are fairly subtle differences, but none the less each of these Large Growth ETFs will exhibit slightly different performance during different market conditions. Not all ETFs make sense for all investors. There are a number of ETFs that move inversely with a given benchmark. For example there are ETFs that move in the opposite direction of the S&P 500 index. What many investors fail to understand is that these movements are tied to the markets on a daily basis, over longer periods of time the performance may not be as closely tied to the inverse performance of the index due to the use of derivatives in these products. Leveraged index ETFs are available both long and inverse. These ETFs multiply the movement of the index both up and down. This is great if you’ve “bet” in the right direction. However if for example you hold a leveraged ETF that goes 3 times inverse of the S&P 500 Index during a market rally the ETF will drop in value roughly 3 times as much as the gains on the S&P 500. There is nothing wrong with either inverse or leveraged ETFs as long as you understand how they work, when and when not to use them, and are comfortable with the risks. In my opinion these products are not appropriate for most individual investors. With the advent of “funky” index products as mentioned above and with the growth of actively managed ETFs, investors really need to understand where they are investing their money more than ever. ETF providers are just like mutual fund providers (in fact many firms offer both) in that they are about gathering assets and making a profit. There is nothing wrong with this, but make sure that you invest based upon your needs and unique situation and that you ignore their hype, especially about “new and better” ETFs. One of the great features about ETFs has generally been their low expense ratios. Just as with mutual funds and any other investment vehicle the cost of ownership is critical, cheaper is better. Along these same lines there is an ETF price war going on. The major players are Vanguard, Barclay’s (via their ishares), and Schwab who is trying to make inroads into the ETF business. It is key to make sure that the ETF product fits your needs and your portfolio, don’t just opt for the lowest expense product. It is also important to note the transaction fees involved in buying ETFs. Remember ETFs trade like stocks during the trading day as opposed to mutual funds which trade daily after the market close. A number of custodians offer no transaction fee trades for certain ETFs. Look at how you will be investing. Will you make larger lump-sum purchases? If so, paying a transaction fee for an ETF really won’t make much of an impact. However, if you will be making smaller purchases, say via dollar-cost averaging, it pays to look around. Do you use ETFs? Please leave a comment about your experiences with ETFs both good or bad. Please contact me with any thoughts or suggestions about anything you’ve read here at The Chicago Financial Planner. Don’t miss any future posts, please subscribe via email. Please check out our resources page as well. What Do ETFs and Youth Soccer Have in Common? ETF Price Wars: A Good Thing or Just More Hype? Smart Beta ETFs the Next Big Thing? How Much Apple Stock Do You Really Own? As currently all the funds are in Vanguard ETF’s I am currently considering if I want to transfer my Roth IRA completely to Vanguard. I need to still do more research on how the handle this, but I think it would remove the transaction fees I have to buy and sell the ETF’s, which are mildly low, but they are still there. I really think ETF’s are a great tool, and when used properly get you incredibly close to tracking an index. Which is good enough to beat quite a few mutual funds. Adam thank you for your comment. Vanguard does a great job in the ETF space and I believe that if you have an account there the transaction fees are waived. Generally you will need to have a brokerage account attached to your IRA, Roth, etc. Index ETFs from the likes of Vanugard, ishares, and the SPDRs are generally good, low cost, style pure choices. In many cases these index products beat most of the active managers in their asset class. The parallel to mutual fund growth is eerily similar. Though in a backwards sort of way with ETFs – from index to actively managed. And we’re still in the early stages. I could easily see the ETF landscape being more muddled and confusing than mutual funds ever were. Your reminder on underlying indexes is an important one. I suspect the growth in indexes will continue as fund companies look to tweak performance with weighting changes in an effort to differentiate themselves. Jon thanks for your comment. My biggest concern is with the growth of questionable indexes and benchmarks. The potential for disappointing results for unsuspecting investors is huge in my opinion. 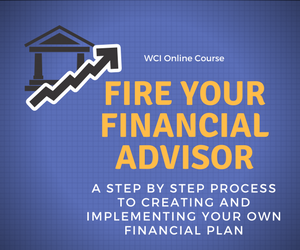 Why Should I Care if My Financial Advisor is a Fiduciary?